Hidden away on just the other side of that big pile of rocks on the eastern edge of the Las Vegas Valley is the largest man-made lake in the United States, Lake Mead. It's located within the 1.5 million acre Lake Mead Recreation Area, the first national recreation area in the country. The Lake was formed by the completion of Hoover Dam in 1936 to control flooding on the Colorado River, harness it's power for electricity generation, and as a water reservoir for the southwestern states. At capacity, the lake has 550 miles of shoreline and is 110 miles long. There is also a 2nd reservoir in the recreation area to the south of Hoover Dam. 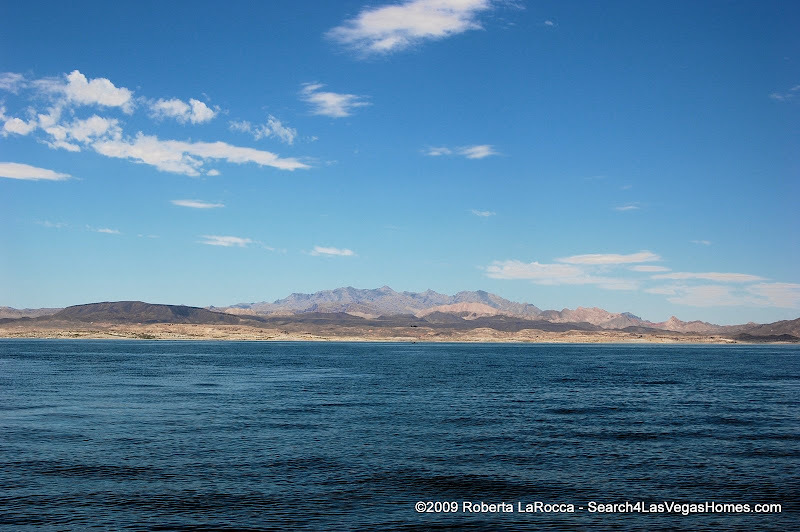 Lake Mohave was formed by the building of the Davis Dam in 1953, just north of Laughlin, NV and Bullhead City AZ. The lake is smaller than Mead, with it's widest point only about 4 miles across, but at 67 miles long it has nearly 240 miles of shoreline. Of course the high water mark 'bathtub ring' at Lake Mead is still visible from the drought in the Rockies that began in 1999. I've mentioned the new water management programs that have been put in effect for the Colorado River. Part of that plan is to balance the water levels by allowing the upstream Lake Powell, that had been down to nearly a third of capacity, to refill. While that meant less water for Lake Mead until it reached predetermined peaks, it appears Lake Powell levels have been improving with the new plan, and reached peak levels of over 66% capacity in mid-July, 2009. While Lake Mead is low and continued management and conservation is key, there are still several trillion gallons of water to enjoy. Swimming is very comfortable in the summertime 80°+ water (we read near surface temps around 90° in some coves). Then there's always jet skiing, boating, water skiing and wake boarding, and fishing (some large ones down below according to the fish finder) and camping out under the stars either on the lake or at one of the marinas' slips, or staying at a campground or trailer lodge in the park. All this while enjoying the rugged beauty of the mountains, the changing colors of the mountains and water with the angles of light or shading of clouds, and even a visit form some wildlife. Our son Dave had an on-shore close encounter with a bighorn sheep in one of the coves. After initially running away, it came back down to the shore to within 15' of him. Unfortunately the rest of us were in the water at the time and couldn't get to the camera for the face-to-face shot. Even if you don't own a boat you still have options. Rentals are available from Lake Mead Concessionaires. Everything from PWC's, runabouts, patio boats, to various sized houseboats can be reserved, and for raft, canoe, and kayak trips on the Colorado. If you just want to leave the driving to someone else, you can also enjoy the breathtaking scenery on Lake Mead Cruises for day brunch or sightseeing, or evening dinner cruises. You can also find more information and boating safety at FunontheLake.com where there is also a contest for Nevada residents to win a week long houseboat and skiboat rental. Now on to the Photoshow of boating Lake Mead, and you might even notice some of our local Nellis AFB crew doing a little training in a Blackhawk Helicopter. To watch full screen, instead of using PLAY, click the HD or Full Screen button on the bottom of the player below, and when finished click it again or use the ESC key to return. These pictures and others of the Las Vegas area are also available as higher quality large images that are downloadable in my Picasa Photo Album. They are under a creative commons, so you can have them for personal use, like a wallpaper. For any commercial uses, just get in touch. One of my night images of City Center is being used for the International Structural Engineering and Construction Conference hosted by UNLV in September, so permissions are possible if you ask.